Author and mobile development expert Maximiliano Firtman shows you how to develop a standard app core that you can extend to work with specific devices. This updated edition covers many recent advances in mobile development, including responsive web design techniques, offline storage, mobile design patterns, and new mobile browsers, platforms, and hardware APIs. With the second edition of this popular book, you’ll learn how to build HTML5 and CSS3-based apps that access geolocation, accelerometer, multi-touch screens, offline storage, and other features in today’s smartphones, tablets, and feature phones. The market for mobile apps continues to evolve at a breakneck pace, and this book is the most complete reference available for the mobile web. With the second edition of this popular book, you’ll learn how to build HTML5 and CSS3-based apps that access geolocation, accelerometer, multi-touch screens, offline storage, and other features in today’s smartphones, tablets, and feature phones. 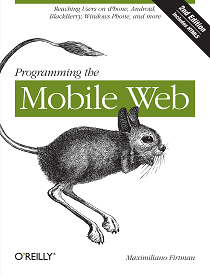 The market for mobile apps continues to evolve at a breakneck pace, and this book is the most complete reference available for the mobile web.